THE FINAL CHAPTERS: NEED A GOOD DOSE OF GUILT---CALL ME! We ALL work best under different conditions---I make lists---LOTS OF LISTS----lists of the lists I am keeping. THERE SHALL BE NO COMMENTS FROM MY JAMES RELATIVES! I celebrate marking things off my lists! I keep the same list until EVERYTHING is marked off the list---WeLL--let me back-track--occasionally I have to make a new list with a carry over item or two--LONG TERM projects! I like to start a project and finish that same project before moving on. For obvious reasons--sometimes we can't finish an item on our list---but that is OK--I can handle that frustration. SO my Inn Keeper-here in R---Helen --is a very talented person with MANY talents. She has projects scattered all over the room that are in various stages--some almost finished-some part way---some not even started. I asked her today, "What is that green pile by your couch?" She told me it was a CHRISTMAS QUILT that ONLY needed binding to finish. She told me she would get to it and that the binding was already half way on. I REALLY REALLY only said , "Oh". Within 15 minutes she is clearing away the other projects around the sewing machine and when I asked what she was doing. 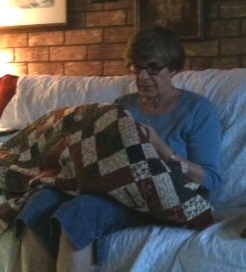 She told me that she was going to finish that quilt. I PROMISE --I did not say another thing---WELL MAYBE I did say---We work very different--I normally finish a project before moving on. ANYWAY---I may have ALL her projects finished before I leave in May.. SO you need an old fashioned dose of guilt-----CALL ME--I am available!